Summary: Ah, Beach Week: a time-honored tradition in which the D.C. suburbs’ high school grads flock to Chelsea Beach for seven whole days of debauchery. In this dark comedy, ten teenage girls plan an unhinged blowout the likes of which their young lives have never seen. They smuggle vodka in water bottles and horde prescription drugs by the dozen. Meanwhile, their misguided, affluent parents are too busy worrying about legal liabilities to fret over some missing pills or random hookups. 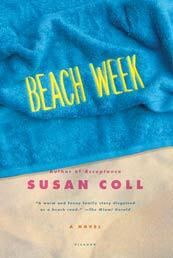 BEACH WEEK by Susan Coll is another book that I packed for this year's beach trip. For some reason, I didn't read the book's description prior to picking up the book, and I assumed that the story took place at a beach. Could it have been the title and the towel on the front cover? Anyway, I was surprised to see that the majority of this novel actually took place in the D.C. suburbs, not the beach. However, I found that I was extremely entertained by this satiric look at domestic bliss, helicopter parenting, lawyers, and general life in the suburbs. BEACH WEEK tells the story of the Adler family who recently moved from middle America to an affluent suburb of Washington, D.C. When daughter Jordan and her friends begin planning their senior beach week trip to Chelsea Beach, parents Charles and Leah most definitely want to be involved. Of course, they worry about Jordan's safety as well as how they are going to keep the partying to a minimum. However, they soon find the other parents seem to be more worried about limiting their liability than the welfare of their children. These meetings are just another example of how the Adlers feel as if don't they belong in their new community. In BEACH WEEK, each of the Adlers are at a sort of crossroads -- they are experiencing their own personal problems and have turned away from each other. Jordan feels like an outsider at her school so she begins an obsession with an older, college man. Charles is having difficulties with his job and he's also going through a type of mid-life crisis; and Leah is trying to find her identity as a mother, wife, and woman. While parts of BEACH WEEK were certainly exaggerated to make some points as well as to entertain, I think that the characters in this novel all have some very real (and relevant) issues. BEACH WEEK was a lot of things (all good), but it stood out to me as an insightful look at parent/teen relationships, and I have to tell you that it scared the heck out of me! I realize that this book (hopefully) exaggerated a few things about crazed/over-protective parents and their teenagers' behavior, but so much of it hit a little too close to home. In fact, the scenes with the parents brought to mind a very stressful PTO meeting at our elementary school last year about food allergies. After I sat in this meeting and heard what they had to say, I couldn't believe my ears! Maybe Ms. Coll wasn't too far off with the behaviors of her characters? I would love for my friends to read BEACH WEEK -- primarily because it would be so fun to discuss the parents in this novel. I have a feeling that we would a few names would come to mind (of course, that would only be after a few glasses of wine!) There is a reading guide available in the back of the book with thirteen terrific questions which might help generate some deeper conversation. Some of the themes you might want to discuss include parent/child relationships, the role of parents, family dynamics, the sense of belonging, social networking, the need to commemorate, and the author's use of satire. I found BEACH WEEK to be such an entertaining novel. I loved Ms. Coll's wit and insight -- the novel was so smart! Definitely recommended to parents of teens and anyone who appreciates a good satirical look at today's parents! Oofa. I haven't read this book yet, but I suspect it is EXACTLY like reality, based on what I've seen in my neck of the woods. Kinda makes me want to lock 'em up in my closet. This does sound disturbingly good...thank you for sharing!!! I'm with Sandy - I have a feeling this is based on true stories. The parents are more frightening than the kids during the high school years. I have a feeling I'll be able to relate to this book. I will read any book that might help me prepare for those teenage years...my oldest turns 9 this weekend, and I'm feeling 13 creeping closer...AHHHHH. Although this book wasn't what you originally thought, I 'm glad it turned out for you. Thnaks for the review. Having gone on Beach Week at the same beach when I was in HS, I really want to read this one. I also want to read her earlier book, Acceptance.